To prepare the tres leches gelatin: Bring 1 cup of milk to a boil in a medium saucepan. Reduce heat to medium-low and allow the milk to simmer for 5 minutes. Add the sweetened condensed milk, evaporated milk and vanilla extract, and stir to combine. Increase the heat to medium-high to return to a simmer, then reduce to medium-low and let simmer for 5 more minutes. Remove from heat and pour into a large mixing bowl. Pour 1/2 cup of lukewarm water into a medium bowl and add 2 envelopes of unflavored gelatin. Stir until well combined, then let it rest until the mixture puffs up (it will increase slightly in volume and appear as if it’s solidifying) – approximately 4 to 5 minutes. Meanwhile, fill a small saucepan with 2 to 3 inches of water and bring to a simmer over medium-low heat. Place the bowl with the puffed-up gelatin mixture on top of the saucepan with the simmering water. Let it rest there, stirring occasionally, until the gelatin has completely dissolved and the mixture has a barely amber color – approximately 3 to 4 minutes. Remove from heat. Pour the dissolved gelatin into the bowl with the tres leches mixture and stir to combine. To prepare the Strawberry Gelatin: Pour the juice into a large mixing bowl. Repeat the same process to mix and dissolve the gelatin as outlined in the second paragraph above. Pour the dissolved gelatin into the juice and stir to combine. 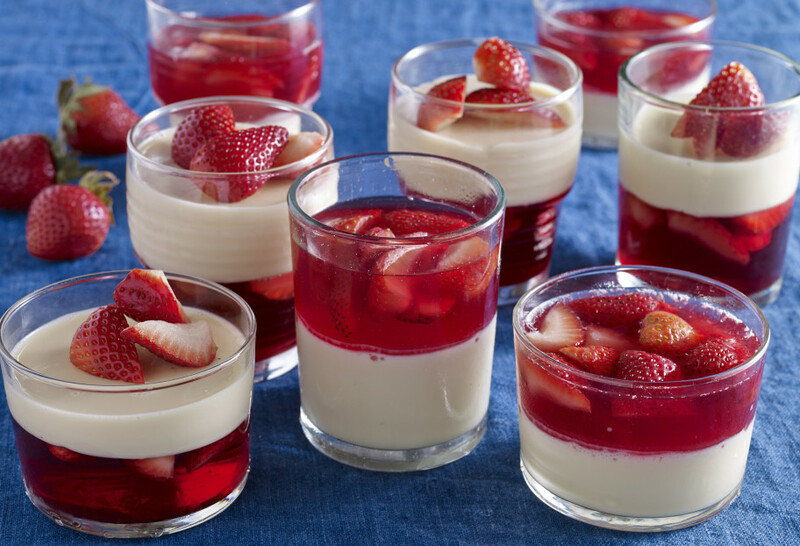 To layer your tres leches and strawberry gelatin: In plastic cups or single-portion gelatin molds, use a liquid measuring cup or small pitcher to fill about 1/3 of each cup with the tres leches mixture. Place the cups into the refrigerator until the gelatin sets (appears solid and does not slosh when moved), about 20 to 30 minutes. Do not put the bowls with your remaining tres leches mixture and juice mix in the refrigerator. Remove the cups from the refrigerator and pour the juice mixture on top of the tres leches, filling about another 1/3 of the cup, and add some strawberry pieces. Cover the cups with plastic wrap, return them to the refrigerator, and let chill for at least 2 hours before serving. If you want to use a large 8- to 10-inch serving mold, fill it halfway with tres leches mix and refrigerate until set, about 20 to 30 minutes. Then pour the juice mixture on top and carefully add the strawberry pieces. Refrigerate for at least 2 hours before unmolding. It should be firm and not feel sticky or sag, and it should slide easily out of the mold with a few gentle shakes. Hint: If your gelatin mixtures start to solidify while you are waiting for layers to set in the refrigerator, not to worry! Adding a little at a time, stir water into the mixture until it becomes liquid, again. Hola Paty. Gracias por la forma en la que explicas tus recetas, agregándole una pequena historia del platillo que estas preparando. Y creo que es li do cuando cocinas con tus hijos. Bendiciones. Hoy vi tu programa por primera vez y quede facinada! Aqui tienes una fan mas!! I watch your show with my oldest daughter (she’s 9) and she absolutely loves you!! We both love your accent and I love that she is learning to cook Authentic Mexican food because of your show!! Bring on more episodes!! Muchas Gracias por todo que haces!! Muchas gracias, Amanda! Por favor send your daughter one big hug from me.